As the title would suggest, one wouldn’t even think that this is the same Lancer in its most advanced form that is India currently. The Audi like front grille has been inspired from Japanese fighter planes but then here in India, the Mitsubishi diamond logo wouldn’t command a second glance as say the Audi one. There is a gray color moulding which holds the diamond logo in place. Beneath it, the radiator is prominently displayed. Wherever you go, this car is bound to grab eyeballs like anything. However most of the ignorant types would think this is just a mod job and not an original car, that it is. The head lamps though remind one of its Mitsubishi Lancer roots. Weird as it may seem, this car lacks the fog lamps and the meshed air dam grille looks bare due to it. The bonnet features an aggressive air intake with two smaller meshes in the front. To grab the eyeballs more, the wheels are 18 x 8.5 in. 5JJ size. If the face didn’t intimidate any one, then the wheels would definitely do that job. The tyre size is P245/40 R18 93Y. 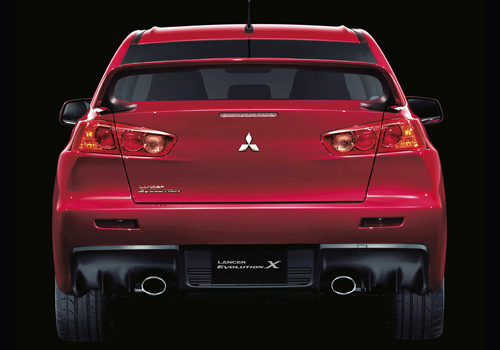 The rear profile looks more like a jacked up Mitsubishi Cedia rear end with a plastic moulding holding the twin tail pipes. The keyless boot entry system coupled with those split tail lamps jazz up the affairs all the more. Ohh, there is a huge spoiler wing at the rear to show its racing intent. Overall, it feels like any one’s (atleast mine) dream car and one that everyone feels that they should have built with, if they had to do a modification job. The moment you enter the cabin, the first thing that you would notice are those Recaro bucket seats. With their massively supportive sides as well as the carbon fibre trimmings, this would fit most of the sizes. The bad part is the none adjustable steering wheel, which I had to wrestle with to get into the driver’s seat. Now, this car is all about grey interiors and all. It has a 3 spoke steering wheel(wonder why after seeing three spoke units, I am always reminded of the Honda Civic) which has the audio controls as well as Bluetooth for the uninitiated. The plastic quality for a car which would compete against the likes of Mercedes, Audi and BMW leaves something to be desired. There are cubby holes in galore along with bottle holders. Auto climate control is another feature which ensures for the comfort of passengers however the main thing is that the cabin is slightly tilted towards the driver. The Rockford Fosgate music system as always is wonderful and brings out the Jawaani in Sheila. 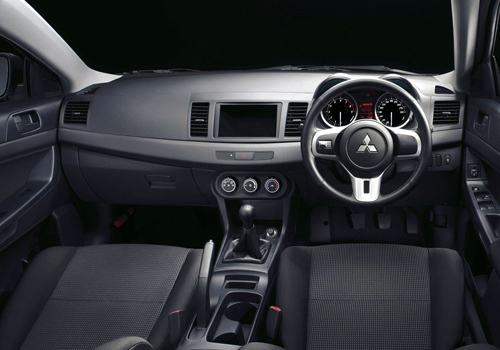 The rear seats are also comfortable but then who would buy a Mitsubishi Lancer EVO X and be chauffer driven. You buy this car because you love driving and that is the point that the company is harping on. But then since the car has been launched in India, there are chances that some of the buyers may prefer to be chauffer driven. But then, in its race spec, the car is totally bland in the interiors. Boot space is also decent at 465 liters but then, the loading lip is higher than the competition. The Mitsubishi Lancer EVO X in India would have Multi-link type suspension with Eibach springs, rear Stabilizer Bar, forged aluminum control arms and Bilstein shock absorbers whereas the front features Eibach springs with Bilstein shock absorbers, McPherson type strut (inverted strut) with forged aluminum control arms along with front stabilizer bar. Such a complicated setup is tuned more for handling rather than ride comfort. However this doesn’t take away the ride quality bit from this sedan. Agreed that it is tuned a bit hard and those bumps are evident once you are city speeds however load the car fully(Europeans better close your eyes at this sight) and the ride quality is very pliant. It doesn’t bottom out when fully loaded. The handling of this car is par excellence and doesn’t deserve any special mention. The tyres do a fantastic job of controlling this car as do the mechanics. It is more like that go karting car which you have. The more and more you chuck it, the more you feel that it can handle some more. At times, I was actually trying to get this car on its back like a turtle but all my attempts at the same were brought to nil with the car settling into a nice understeer. Tested the very limits of my driving, I would say. Fast and Furious , any one? 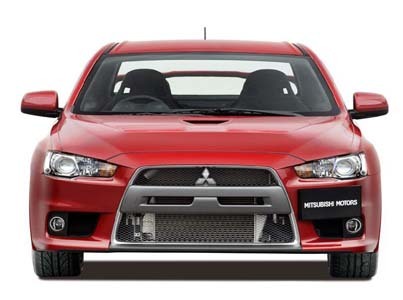 The Mitsubishi Lancer EVO X in India is offered with a single engine option. Needless to say, Mitsubishi Motors have gone in for a petrol motor. The 2.0 liter engine is very high tech and made up of aluminium. It gets twin cam, 16 valves and 4 cylinders. It gets Mitsubishi’s patented Mitsubishi Innovative Valve-timing Electronic Control System or MIVEC as we all know it. It also gets the most advanced turbo charger in its competition. It is mated with a 6 speed triptronic gearbox. The engine does seem to suffer some sort of turbo lag below 1500 rpm but then nudge it past the 3,800 rpm mark, with the turbo on spool, there is maniac action going all the way. While I was tempted to slot it into manual mode, the automatic, with its responses made me think otherwise. The 0-100 kmph was dispatched only in 5.6 seconds. By the way, this motor makes 291 bhp at 6500 rpm whereas the torque figure reads as 491 Nm at 4000 rpm. The top speed that I attained out of this car is 208 kmph with the motor spinning at around the 8,500 rpm redline. The turbo whistle from this motor would entice any one to downshift and go through the aural delight time and again. Truly enjoyable performance. This car however requires 97 Octance petrol for optimum use of its performance. To reign all this performance under control, Mitsubishi Motors have offered the Mitsubishi Lancer EVO X in India with 4 caliper piston Ventilated disc brakes in the front whereas the rear wheels are fitted with Solid disc brakes featuring 2 calipers. Assisting them in retarding the motion are ESP, ABS and EBD. There is Active Stability Control (ASC) working overtime in this car. As far as safety is concerned, the car gets 6 air bags, and a Refined Impact Safety Evolution (RISE) body chassis. This along with the child safety locks, three-point seat belts, head restraints and also the seat belt pretensioners make for a safe car. Now, people in this segment don’t go about asking for fuel efficiency but then this car returns 8 kmpl in the city whereas on the highways this figure rises to 12 kmpl. Sufficient for all that performance which would make one feel like driving a sports car. The Mitsubishi Lancer EVO X in India is an effort by Mitsubishi Motors to bring in their world best to India. This car does have a very capable chassis which is used for rallying. Since the time the company has entered rallying, their chassis has been the same albeit modified over the years. This car has got the looks(no doubts about it), interior space(comparable to BMW 5 series), stonker of an engine and all the performance to go with the show. The things lacking are the interior quality, features offered and only a single engine trim. 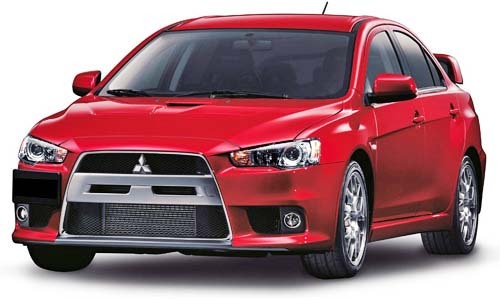 The other thing, the Mitsubishi Lancer EVO X price in India is Rs 49,95,000 (ex-show room, Delhi). Since it is a CBU and Mitsubishi Motors intend to keep it this way for some time to come, there are very less chances of this car been affordable. However for those having the moolah, this is a very good car.